According to the Tetrad Principle, the seven regular polygons making up the inner Tree of Life should acquire a special status when they are Type C because this variety of polygon is the fourth, starting from a bare polygon. This article analyses each Type C polygon and the sets of seven Type C polygons when separate and when enfolded. The Type C triangles embody the superstring structural parameter 168 and the dimension 248 of E8, the rank-8, exceptional Lie group describing the symmetry of the forces of one of the five types of superstrings. The two Type C squares embody the superstring structural parameter 336. The Type C pentagon embodies both the number 137 determining the fine-structure constant and the number of bones in the adult human skeleton. The two Type C hexagons embody the dimension 496 of E8×E8. A single Type C octagon embodies the number 336. The two Type C decagons embody the superstring structural parameter 840. The Type C dodecagon embodies the number 336. The (7+7) Type C polygons separated by the root edge have 496 corners of triangles. The superstring structural parameter 1680 is the number of hexagonal yods inside the seven separate Type C polygons. The Godnames ADONAI, YAHWEH, ELOHIM & ELOHIM SABAOTH prescribe the inner Tree of Life when its polygons are Type C. Representing by a Tree of Life each of the five revolutions made by each of the 10 whorls of the UPA/subquark superstring, the triangles making up the first (6+6) Type C polygons enfolded in 50 Trees have 16800 corners that correspond to the 16800 turns in the 10 helical whorls. The inner form of a single Tree of Life embodies the number 1680 as the number of corners & sides of triangles outside the root edge that are not shared with its outer form and which are not pure corners of polygons. Table 2. Number of geometrical elements in the 7 separate Type C polygons. Table 3. Number of yods in the 7 separate Type C polygons. half-revolution of a whorl of the UPA. The Type C triangle has 127 yods, where 127 is the 31st prime number and 31 is the number of EL, the Godname of Chesed. The two joined Type C triangles have 246 yods outside their shared side, where 246 is the number value of Gabriel, the Archangel of Yesod. 248 yods surround their centres, where 248 is both the number value of Raziel, the Archangel of Chokmah, and the dimension of E8, the rank-8 exceptional Lie group. Alternatively, they have 248 yods that are intrinsic to them in the sense that they are unshared with the outer Tree of Life, their left-hand and right-hand corners coinciding with, respectively Geburah and Chesed (Fig. 5). Embodied in the Type C triangle are both the structural and the dynamical parameters of a superstring! 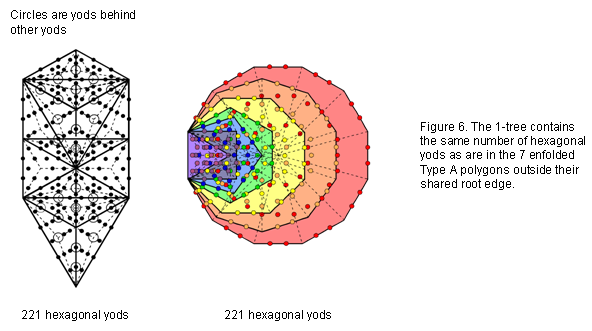 number of hexagonal yods in the 1-tree and in the seven enfolded Type A polygons outside their shared root edge (Fig. 6). Figure 7. 168 yods surround the centre of the Type C square. Surrounding the centre of each separate Type C square are 168 yods (Fig. 7). Whereas both triangles are needed to embody this superstring structural parameter, the square on its own achieves this. 30 of the letter lamed ל (L). The Type B pentagon has 76 yods (Fig. 9). This is the number value of YAHWEH ELOHIM, the Godname of Tiphareth. The number 26 of YAHWEH is the number of red yods lining the sides of the five basic sectors of the Type C pentagon. The number 50 of ELOHIM is the number of black yods. These embodiments of two well-known Godnames are described here to set the stage for the later discussion of how the pentagon embodies the number of bones in the adult human skeleton and the number 137 that determines the fine-structure constant at the heart of quantum electrodynamics, the highly successful theory of electromagnetic interactions. their centres. 282 is the number value of Aralim, the Order of Angels assigned to Binah, whose Godname ELOHIM has the number value 50. The number 70 is a parameter of holistic systems, being the number of yods in the Tree of Life when its 16 triangles are tetractyses. The five black sides of the pentagon and the five black sides of its sectors correspond to the (5+5) Sephirothic corners of these triangles. The 60 remaining red sides of the 45 triangles correspond to the 60 hexagonal yods in the Tree of Life constructed from tetractyses. This 10:60 pattern expresses the difference between Malkuth and the six higher Sephiroth of Construction in the outer Tree of Life. Its counterpart in its inner form is the dodecagon and the six regular polygons that precede it. 140 geometrical elements in the Type C pentagon surround its centre, where 140 is the number of Masloth, the Mundane Chakra of Chokmah, whose Godname YAHWEH has the number 26. 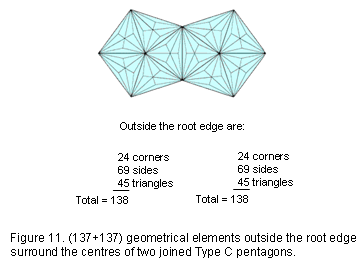 137 geometrical elements outside the root edge surround its centre (Fig. 11). We see that the geometrical composition of the Type C pentagon embodies the number 137 determining the fine-structure constant α = e2/ħc ≈ 1/137 well-known to physicists, whilst the number of bones in the adult human skeleton is embodied in its yods other than its corners (see here). ELOHIM, the Godname of Binah, prescribes the pair of joined Type C pentagons because its number value 50 is the number of corners of their 90 triangles, whilst YAHWEH, the Godname of Chokmah with number value 26, prescribes the 26 corners of the 45 triangles in each pentagon. The two joined Type C pentagons have 229 lines & triangles, where 229 is the 50th prime number. ELOHIM prescribes both the number of corners of the triangles in the two pentagons and the number of their sides & triangles! The pair of joined Type C pentagons has 189 corners & sides, i.e., 187 corners & sides surround their two centres. 187 is the number of Auphanim, the Order of Angels assigned to Chokmah. 95 corners & sides in a Type C pentagon surround its centre, where 95 is the number value of Madim, the Mundane Chakra of Geburah. A corner of each pentagon coincides with the centre of the decagon when it is part of the inner Tree of Life. This means that surrounding the centre of each pentagon are 136 geometrical elements outside the shared root edge that are intrinsic to this polygon in the sense that they are not part of any other polygon in the inner Tree of Life. The pair of pentagons has 272 such geometrical elements, where 272 is the number value of Cherubim, the Order of Angels assigned to Yesod. value of EHYEH, the Godname of Kether. It contains 206 yods other than its five defining corners (Fig. 12). In other words, given a pentagon, 206 more yods in 45 tetractyses (comprising 21 corners and 185 hexagonal yods) are needed to transform it into a Type C pentagon. This is how the pentagon, whose diagonal width a and side b are in the proportion of the Golden Ratio: a/b = Φ = (1+√5)/2 = 1.618..., embodies the number of bones in the adult human skeleton. Many artists through the centuries have believed that this famous ratio determines the relative proportions of parts of the ideal human body. Whatever the truth of this controversial claim, here is an indisputable, exact mathematical connection between its bone composition and the Golden Proportion Φ. Article 32 & Article 33 explain how the outer & inner Trees of Life embody the human axial and appendicular skeletons (see also Human skeleton). Article 36 shows how the disdyakis triacontahedron — the polyhedral form of the inner Tree of Life — embodies 206 yods symbolizing the 206 bones (see also here). 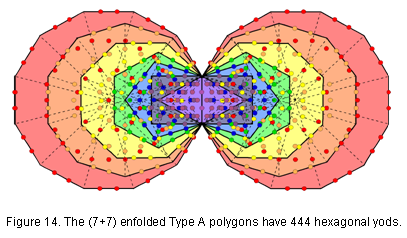 the seven enfolded Type A polygons (Fig. 16). 280 geometrical elements comprising 50 corners, 140 sides and 90 triangles surround the centre of the decagon. 840 yods surround the centres of two separate decagons. This is the number of turns in an outer or inner half of a whorl of the UPA. (2×168=336) red yods. The superstring/UPA significance of this is discussed here under the heading "TYPE C DODECAGON", here and here. The way in which the heptagon and outer Tree of Life embody the number 504 is discussed here. The fact that the dodecagon is the first single polygon to embody superstring structural parameters in terms of both its geometrical and yod compositions (the hexagon does the same but only as two separate polygons) confirms its unique status as the polygonal version of the outer Tree of Life. 500 (=50×10) yods outside the root edge surround its centre. This is how ELOHIM, the Godname of Binah with number 50, prescribes the yods that construct the dodecagon. Surrounding the centres of the two joined dodecagons (the tenth regular polygon) are (1000=103) yods outside the root edge. This illustrates the power of the Decad. there are 496 corners present. Associated with each set are 248 corners (240 corners of triangles, 7 centres & one endpoint). This 248:248 pattern represents the (248+248=496) roots of E8×E8′, one of the two symmetry groups of heterotic superstrings. The seven separate polygons have 672 sides and 672 corners & triangles surround their centres. This number was encountered in the discussion here of the first four Platonic solids when their faces and interiors are constructed from tetractyses. It was found that they contain 672 yods, making an average of 168 yods per Platonic solid. The 1344 geometrical elements surround the centres of the seven polygons. This number is embodied in the (7+7) enfolded Type B polygons in the following way: when the outer and inner Trees of Life are superposed, the two side pillars lie in the plane of the polygons, coinciding with the vertical axes of the two hexagons. Each axis contains seven yods shared with a hexagon. One of these is its centre, leaving six other centres. Each set of seven enfolded polygons contain (7+6=13) yods that are either shared yods or centres. Both sets of enfolded polygons have 1370 yods, of which 26 are such yods, leaving 1344 yods intrinsic to the polygons that surround their centres. A Type C n-gon contains 37n hexagonal yods. 2n hexagonal yods line its n sides, inside which are 35n hexagonal yods. The number of hexagonal yods inside the seven separate, Type C polygons = ∑35n = 35∑n = 35×48 = 1680. This is the number of turns in each helical whorl of the UPA. Embodied, therefore, inside the seven separate polygons is this major structural parameter of the subquark superstring. 840 hexagonal yods are inside the dodecagon and the first three polygons (triangles, square & pentagon) and 840 hexagonal yods are inside the next three polygons (hexagon, octagon & decagon). The characteristic 24:24 division of the holistic parameter 48 manifests in the inner Tree of Life as the 840 hexagonal yods inside each of these sets of polygons with 24 corners. This manifests in the subquark superstring as the 840 turns in the 2½ revolutions of the outer half of each whorl and the 840 turns in the 2½ revolutions of its inner half. When the seven regular polygons of the inner Tree of Life are enfolded in one another, a corner of the triangle coincides with the centre of the hexagon and a corner of the pentagon coincides with the centre of the decagon. All the 31 geometrical elements in the sector of the hexagon replaced by the triangle disappear, so that, instead of 169 geometrical elements (see table above). the hexagon is now left with five sectors containing (169–31=138) elements. 46 yods also disappear from this sector because it is a Type A triangle with 46 yods, so that, instead of 253 yods, the hexagon is left with (252–46=207) yods. Tabulated below in Tables 4 & 5 are the geometrical and yod compositions of the seven enfolded Type C polygons outside their shared root edge. Table 4. Number of geometrical elements outside the root edge in the 7 enfolded Type C polygons. Table 5. Number of yods outside the root edge in the 7 enfolded Type C polygons. 49th prime number, showing how EL ChAI, the Godname of Yesod with number value 49, prescribes the skeletal shape of the seven enfolded Type C polygons. Including the two endpoints of the shared root edge, there are 229 corners. The Godname ELOHIM with number value 50 prescribes the number of corners because 229 is the 50th prime number. This is a spectacular illustration of the power of Godnames at work in mathematically determining the geometry of the inner Tree of Life. is the sum of the first 50 odd integers after 1. This shows how both ELOHIM with number value 50 and YAHWEH with number value 26 prescribes how many intrinsic geometrical elements are needed to construct the (7+7) enfolded polygons, starting with the root edge. Such beautiful harmony between number and geometry is powerful evidence of the archetypal status of this sacred geometry. There are 1529 yods outside the root edge lining the 423 tetractyses in the seven enfolded polygons. Hence, (2×1529 + 4 = 3062) yods line the 846 tetractyses in the (7+7) enfolded polygons. The topmost corners of the two hexagons coincide with the lowest corners of the hexagons enfolded in the next higher Tree. This means that 3060 (=306×10) boundary yods are intrinsic to each set of 14 enfolded polygons. 1530 (=153×10) intrinsic, boundary yods are associated with each set. This shows how ELOHIM SABAOTH, the Godname of Hod with number value 153, prescribes the shape of the inner Tree of Life whose polygons are Type C.
the topmost corners of their two hexagons coincide with the lowest corners of the hexagons enfolded in the next higher Tree of Life. This means that 336 corners are intrinsic to each set of (6+6) enfolded polygons. 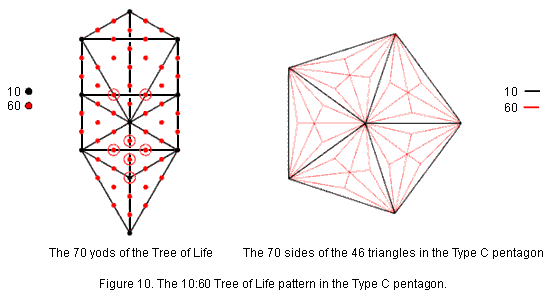 The number of intrinsic corners of the first (6+6) polygons enfolded in n Trees of Life = 336n. The 120 such polygons enfolded in 10 overlapping Trees have 3360 intrinsic corners. This is the number of turns per revolution in all ten whorls of the UPA. Each revolution of a whorl can be represented by a Tree of Life, so that 50 overlapping Trees represent the 50 revolutions of the whorls of the UPA. The 600 polygons of the first six types enfolded in them have (336×50=16800) intrinsic corners. This is the number of turns in the ten whorls of the UPA. The five sets of 10 Trees making up 50 Trees correspond to the five revolutions of 10 whorls. These Type C polygons provide a geometrical representation of the UPA/subquark superstring because the first six polygons constitute a holistic subset of the complete set of seven polygons, as has been illustrated many times elsewhere in this website. The fact that the first six polygons of the inner Tree of Life have 36 corners when separate and 26 corners when enfolded, both enfolded sets having 50 corners serves to illustrate how they are prescribed by the Godnames of the ten Sephiroth (see Article 8 for more details). The 423 triangles in the seven enfolded polygons have 881 corners & sides. There are five corners & sides on the vertical axis of the hexagon that are shared with the outer Tree of Life as its Pillar of Mercy (they are coloured green in Figure 20). Similarly for the hexagon in the other set of polygons, five corners & sides coincide with the Pillar of Judgement. One of these corners is the centre of the hexagon, so that (881−5−6=870=87×10) intrinsic corners & sides surround the centres of the seven enfolded polygons. 87 is the number value of Levanah, the Mundane Chakra of Yesod. 878 corners & sides in each set of seven enfolded polygons are outside the root edge. Of these, five corners & sides are shared with the outer Tree, leaving 873 intrinsic corners & sides. Of these, five are centres of polygons that are not also corners and 28 corners are pure corners in the sense that none of them is also the centre of a polygon. Hence, the centres of each set of polygons are surrounded by (873−5−28=840) intrinsic corners & sides other than their corners. Outside the root edge of both sets of enfolded polygons are (840+840=1680) intrinsic corners & sides that are not pure corners of polygons. Alternatively, each set of seven enfolded polygons has (including the root edge) 881 corners & sides, of which 41 corners are corners of their 47 sectors, leaving 840 corners & sides, so that both separate sets have 1680 such corners & sides other than corners of sectors. Each set separately embodies the superstring structural parameter 840, whilst both sets of enfolded polygons embody the superstring structural parameter 1680. Ten overlapping Trees mapping the 10 whorls of the UPA have an inner form containing 16800 intrinsic corners & sides that are not pure corners of their (70+70) enfolded Type C polygons. This is the inner Tree of Life representation of the subquark state of the E8×E8 heterotic superstring.